Legendary punk rock band Rancid have teamed up with premier music event producer/promoter Synergy Global Entertainment, Inc. (SGE) and respected craft beer event production powerhouse Brew Ha Ha Productions to debut The Bash — a brand new music and craft beer festival hitting the U.S. this spring. The Bash launches on May 11 in Phoenix, AZ and includes a total of 7 stops in May and June. 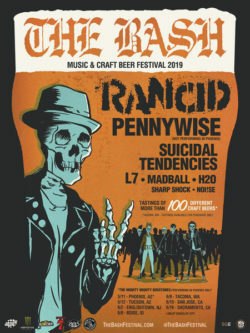 With a lineup curated by Rancid, all dates of The Bash will feature music from Rancid, Pennywise (excluding Phoenix), Suicidal Tendencies, and L7, along with The Mighty Mighty Bosstones (Phoenix only), H20, Madball, Noi!se, and Sharp Shock on select dates. Each date of The Bash will also host craft beer tastings (until 4:00 P.M.) from some of the best breweries in the country. Beer tastings will vary by city according to local alcohol laws and restrictions. Music and brewery lineup details per date can be seen at http://www.TheBashFestival.com. In addition to a diverse selection of participating beers and breweries, each date will offer Brewstomper Golden Ale — a collaboration between Rancid and Ska Brewing out of Durango, CO. Brewstomper will be available at all dates of The Bash for sampling and at concessions, as well as everywhere that Ska Brewing is sold, in both cans and on draft. Note: Pennywise will not perform at the Phoenix date. The Mighty Mighty Bosstones will perform at the Phoenix date only, as direct support. Additional support varies by date. Tickets for all tour dates of The Bash go on sale Friday, February 22 at 10:00 AM local time at http://www.TheBashFestival.com, with General Admission tickets starting at $39.50 (plus fees) and VIP tickets starting at $99.50 (plus fees), while supplies last. The Bash is 21+ only during craft beer tastings, and is open to all ages after 4:00 PM. VIP tickets include: One VIP admission ticket to The Bash; a dedicated VIP entry lane into the venue; one hour early entry for up to 4 hours of craft beer tastings (Noon – 4:00 PM, 21+ only); and access to the The Bash VIP Lounge, which includes: comfortable areas to sit and relax, a VIP bar, private restrooms, convenient food options available for purchase, and more. After 4:00 PM all ages are welcome into the VIP Lounge area. Additional VIP ticket perks – including views of the main stage and exclusive beer tastings – vary by market. Visit http://www.TheBashFestival.com for exact ticketing details per date. Sponsors for The Bash include: Ska Brewing Co., Monster Energy, Seagram’s 7, Mike’s Harder, White Claw, 805 Beer and Wienerschnitzel. Sponsor activations vary by market. 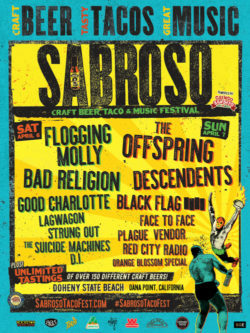 Saturday, April 6: Flogging Molly, Bad Religion, Good Charlotte, Lagwagon, Strung Out, The Suicide Machines, and D.I. Sabroso Craft Beer, Taco & Music Festival kicks off at 1:00 PM each day (with doors for Early Entry and VIP guests opening at Noon, to allow for an added hour of tastings). During tastings (available until 4:00 PM), craft beer lovers 21+ can choose from over 150 craft beers from the finest breweries in the nation. Tastings will feature tons of local favorites, with an initial list of breweries including: Artifex Brewing Company, Burgeon Beer Co., MadeWest Brewing Co., Chapman Crafted Beer, Fall Brewing Company, Modern Times Beer, Docent Brewery, Noble Ale Works, Russian River Brewing Company, and many more to be announced. Attendees are also invited to sample all flavors of Gringo Bandito—Dexter Holland of The Offspring’s top rated hot sauce—during the event. This year will mark the 9th Annual Gringo Bandito Chronic Tacos Challenge, where professional eaters from around the world compete for cash prizes and the highly-coveted title of Chronic Tacos Eating Champion. World-champion competitive eater Takeru Kobayashi, from Nagano, Japan returns to defend his 2018 Gringo Bandito Chronic Tacos Eating Champion title, where he devoured an astonishing 154 tacos in 10 minutes. Additionally, taco creations from food vendors will compete for the coveted Sabroso “Best Of Show,” awarded by a panel of food judges. Tickets for Sabroso Craft Beer, Taco & Music Festival go on sale Friday, February 1 at 10:00 AM PT at www.SabrosoTacoFest.com,with Single Day tickets starting at $59.50 (plus fees), Single Day Early Entry tickets starting at $69.50 (plus fees), and Weekend tickets starting at $89.50 (plus fees), while supplies last. For this family-friendly event, kids 7 and under get in free with an adult ticket holder. Single Day and Weekend VIP Lounge tickets will also be available for purchase and include: One VIP admission ticket (Single Day or Weekend) to Sabroso Festival; a dedicated VIP entry lane into the venue; one hour early entry for up to 4 hours of craft beer tastings (Noon – 4:00 PM, 21+ only); and access to the Sabroso VIP Lounge, which includes: exclusive craft beer tastings (Noon – 4:00 PM, 21+ only), a view of the Main Stage, comfortable areas to sit and relax, a VIP bar, private restrooms, convenient food options available for purchase, and a dedicated merchandise stand for convenient shopping. At last year’s sold out Sabroso Craft Beer, Taco & Music Festival powered by Gringo Bandito at Doheny State Beach in Dana Point, CA, 8,500 attendees gathered under the California sunshine for an afternoon of complimentary craft beer tasting with over 40 of the best breweries from Southern California and beyond, gourmet street tacos and more, and Lucha Libre style wrestlers competed throughout the day as the waves of the Pacific crashed behind their beachside ring. A portion of the proceeds from Sabroso will be donated to the Doheny State Beach Interpretive Association (DSBIA), the non-profit cooperating association of Doheny State Beach, dedicated to the protection of the park’s beaches, facilities, marine refuge and its historical, cultural and social stories. Sabroso will also partner with Big Brother Big Sister, who are known for providing strong and enduring, one-to-one, professionally supported mentoring relationships for youth facing adversity. Sponsors for Sabroso Craft Beer, Taco & Music Festival include: Rockstar Energy Drink, Milagro Tequila, Wienerschnitzel, Takis, Chronic Tacos, Del Real Foods, Jarritos, Gringo Bandito, and many more. MOTÖRHEAD are excited to announce June 23, 2018 as the official U.S. launch date for their Röad Crew beer, brewed by Kalamazoo, MI’s Arcadia Brewing Company. Music fans and beer lovers alike are invited to the official launch party, taking place at Arcadia’s Riverfront Brewery, Pub and Beer Garden, incorporating Lemmy’s Lounge, in Kalamazoo, MI. The party will begin at 3:00 PM and will include live music from the rock band Bonehawk, MÖTORHEAD tribute Band Kilmister, and Detroit metal band Anguish. In between bands, the Bangarang Circus group will entertain with burlesque, aerial and fire-breathing acts. Röad Crew is an American IPA and sits around 6.2% ABV. This is a crushable hop-forward India Pale Ale with attitude that showcases a floral and citrussy hop character with just the right amount of malt sweetness. Röad Crew beer is perfect for all rock, beer and hop heads and goes down especially well whilst listening to MOTÖRHEAD at a wonderfully obscene, lawn-killing volume. Röad Crew will be available in bottles, cans, keg and even cask. Röad Crew will be available initially in the Great Lakes region of the U.S.. There will be further regional launches throughout the U.S. in the near future, with the goal of providing every rock and beer fan with the beer that’s “LÖUDER THAN EVERYTHING ELSE”. For further information regarding Röad Crew coming to your favorite retail location, please check www.motorhead-beer.com for updates or the official MOTÖRHEAD Beer Facebook, Instagram pages. 91X Presents: Ye Scallywag! Craft Beer, Food & Music Festival Featuring Pennywise and More. The Adolescents & Western Settings. After a successful debut in 2016, and what OC Weekly called “a great day of beer and punk rock,” 91X Presents Ye Scallywag! returns to Waterfront Park in San Diego, CA for its second year. Produced by premier music festival production company Synergy Global Entertainment (SGE), and Orange County, California’s most successful and respected craft beer festival producer, Brew Ha Ha Productions, the day-long craft beer, food and music festival will take place on Saturday, October 21 and feature over 100 craft beers, along with a full day of punk rock music with performances by Pennywise, Me First And The Gimme Gimmes, The Vandals, Lagwagon, Strung Out, The Adolescents, and Western Settings. During VIP and early entry tastings (from 12:00 p.m. – 4:00 p.m.), and general admission tastings (from 1:00 p.m. – 4:00 p.m.), Ye Scallywag! attendees will enjoy unlimited craft beer samples from top California breweries. Local artisan food trucks and pop-up restaurants will also be on site selling a variety of delicious and unique food options throughout the day and evening. Craft beer and other libations will be available for purchase at concession stands as well. The initial list of breweries for Ye Scallywag! includes: AleSmith, Alpine Brewing, Beachwood Brewing, Booze Brothers, Bottle Logic, Chapman Crafted, Fall Brewing, Green Flash, Hangar 24, Mikkeller SD, and Modern Times, with more to be announced. Starting Friday, August 18 at 10:00 a.m. PT, General Admission and VIP tickets will be available for purchase for the following prices. Please note: The event is for those 21 and up and all tickets include beer tastings and access to live music. One hour early entry for craft beer tastings, starting at 12:00 p.m.
Includes 1 VIP admission ticket to Ye Scallywag! ; VIP Entry Lane; and access to the Ye Scallywag! VIP Lounge which includes: early entry at 12:00 p.m. for beer tastings, exclusive tastings in VIP Lounge, VIP viewing from the Lounge, VIP cash bar, and private restrooms. Includes 1 VIP admission ticket to Ye Scallywag! ; access to side of stage viewing platform on the Main Stage; VIP Entry Lane; and access to Ye Scallywag! VIP Lounge, which includes: early entry at 12:00 p.m. for beer tastings, exclusive tastings in VIP Lounge, VIP viewing from the Lounge, VIP cash bar, and private restrooms. Waterfront Park is located at 1600 Pacific Highway in San Diego, near North San Diego Bay. Ye Scallywag! will have a convenient drop off area for ride sharing and taxis, and the Green Line to San Diego’s Santa Fe Depot train station is just three blocks from Waterfront Park.